You will glean insight into the quality of your workplace experience and how your unique firm culture influences client service, and ultimately client loyalty. You also get to benchmark against peer firms and learn how others are meeting the challenges presented in today’s increasingly competitive market. Through our survey and consulting work, we help firm leaders eliminate barriers to partner and employee engagement, enhance client service and ultimately improve the bottom line. 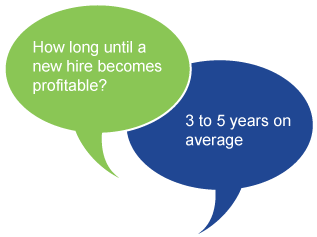 Turnover costs are often estimated to be 100%-300% of the base salary of replaced employees. Percentage of Positions at Law Firms by Gender in the U.S. Guiding long range planning processes, ModernThink has created strategic plans for multiple legal organizations’ including ABA affiliates, American Bar Endowment (ABE) and American Bar Insurance (ABI). Working one-on-one with law firms, ModernThink helps them understand how their People Practices are either enhancing or inhibiting their client service.